You’re On Twitter? Go On Blogging Still! Great! You’re on twitter and you’re quite active there. However, don’t ever make the mistake of abandoning your blog for this new world of micro-blogging that is twitter. There are so many reasons why you should keep your blog up and running. Here, I’ll just mention three most important points about blogging. Firstly, you’re catching a different audience in your blog than in twitter. Your blog has a fine capability of generating search engine traffic that are not possible with your tweets. Besides you may have some RSS subscribers and avid readers who are not interested at all in twitter. It’s a grave mistake dumping this readership and search engine traffic by quitting your blog. Secondly your blog offers a flexibility to handle denser topics that can’t be afforded within the 140 character limit of your tweets. There are so many statements you can make in your blog posts and so many ideas you can address which aren’t possible with twitter. Finally, we’re still in the learning curve with respect to knowing what an active Twitter user is capable of generating. In contrast, you know already what blogging can do. And you started blogging for a reason. And your purpose in blogging was based on evidence about what blogging can achieve. The bottom line is, unless you know something about twitter that the rest of us don’t, there’s no reason to assume that twitter will make up for the advantages that blogging offers. Tweet any time or any way you like, but just don’t give up blogging now! A few more reminders: Don’t neglect to tweet people and make more friends and increase your followers in Twitter. 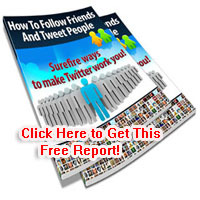 There are several twitter marketing secrets which you may know nothing about. Check it out the marketing power of Twitter today! Please visit online money-making strategies to get free, expert advice on online marketing profits.